Thanks for all the support everyone! The video views are through the roof today! “Believe It” by Devi Genuone & Charlie Guidry with finesse from Lev Berlak. Mixed at The Grill Recording Studios in Emeryville. 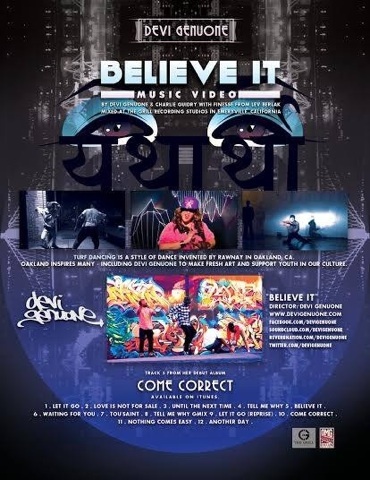 This entry was posted in Art, Come Correct, Devi Genuone, Media, Videos and tagged bayarea, Believe It, Come Correct, devi, devi genuone, devigenuone, music video, video. Bookmark the permalink.